Venezuelan authorities say they arrested five "terrorists" after the shootout. 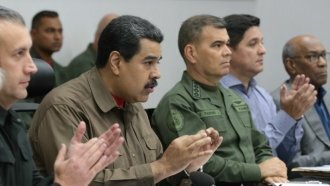 Venezuelan authorities say they "dismantled" an anti-government "terror cell" the same day a prominent insurgent posted dramatic videos of a shootout on social media. Óscar Pérez has been a resistance figure for about a year. He took credit for commandeering a helicopter to drop grenades on the Supreme Court building and fire rounds at the Interior Ministry. President Nicolás Maduro's government has called Pérez a "fanatic." A government statement said it captured five terrorists after the shootout, which left two officers dead and five injured. There was no mention of Pérez.